William Boyce was born in London, the son of a joiner. He became a choirboy at St. Paul’s Cathedral when he was eight years old. He held a string of appointments as church organist before becoming Master of the King’s Musick in 1755, a post he held until his death in 1779. Boyce gradually became deaf; he had to give up teaching and performing and turned to composing and editing works by Byrd and Purcell. Boyce is responsible for a compilation of church music still in use today. His “Alleluja” canon is a favourite with choirs the world over. The Vienna Boys Choir sing it in procession. Henry Purcell was a chorister in the Chapel Royal. After his voice changed, he held a number of musical posts at the court, including organ maker and keeper of the king’s instruments, composer-in-ordinary for the king’s violins and organist of Westminster Abbey, and of the Chapel Royal. During his lifetime, he served three consecutive kings of England: Charles II, James II and William III. It was part of Purcell’s duties to compose works for royal occasions, coronations, weddings, birthdays and funerals. Come Ye Sons of Art is the last of six birthday odes composed for Queen Mary II, who loved music. Come Ye was written for the popular Queen’s 30th birthday on 30 April 1694; her last, as it turned out. The text, probably by Nahum Tate (1652-1715) who was Poet Laureate at the time, is flowery and highly complimentary of the Queen, although it leaves something to be desired for poetic merit. One line in Sound the Trumpet deserves comment; “you make the listening shores rebound” is a play on the word “shore” and the name of the Sergeant Trumpeter to the English king, a Matthias Shore, whose abilities on the trumpet sparked a number of virtuoso compositions for that instrument. Stage Director Susanne Sommer has the Vienna Boys Choir perform a courtly dance of Purcell’s time while they sing. Come, come, ye sons of Art, come, come a way. You make the listening shores rebound. On the sprightly hautboy play. To celebrate the glory of this day. is at once our delight and our duty to pay. Hassler was born in Nuremberg as son of composer Isaak Hassler. He started his musical training with his father. In 1584, Hassler went to Venice to study with Andrea Gabrieli; he was among the first German musicians to do so. In 1586, Hassler was back in Germany, in the employ of Count Octavianus Fugger in Augsburg. In 1600, he became the director of music of the city of Nuremberg, and in 1608, he was appointed chamber organist to the Kurfürst of Saxony in Dresden, quite a prestigious post. Hassler’s last post was in Frankfurt, he was court “Kapellmeister”. Hassler was a protestant, yet he wrote numerous works for both catholic and protestant services. His Latin masses and motets show the influence of the Venetian School, his German music is influenced by Orlando di Lasso, a widely travelled French composer who worked in Munich from 1556. Contemporaries especially liked Hassler’s madrigals and songs. He reused the tune of his popular love song “Mein G’müt ist mir verwirret (My spirit is confounded)” in the famous chorale “O Haupt voll Blut und Wunden”, which appears in Bach’s St Matthew Passion. The text of this motet is taken from Psalm 96, titled “Jahwe, King and Judge”. It was originally a liturgy sung at the New Year festival to celebrate God as ruler of the universe. Sing to the Lord all the world. Tell aloud of his salvation, day by day. and all peoples of his miracles. The “Gloria” is part of the Mass ordinary; the words date to the early Middle Ages. Vivaldi wrote at least three settings, of which two survive. RV 589 is a hugely popular piece: There are over 100 recordings of it (including one by the Vienna Boys Choir), and it has been used to great effect in several films, “Shine” (Scott Hicks 1996), “The Hunter” (2011), and “Songs along the Silk Road”, Curt Faudon’s 2008 film about the Vienna Boys Choir. Antonio Vivaldi wrote his Glorias around 1715 for the orphans at the Pio Ospedale della Pietà where he was employed as a music teacher and composer. The Ospedale was initally founded as a hostel for Crusaders. After the Crusades, it changed into a charity for orphans and abandoned girls. Unwanted infants could be left at the scaffetta, an early form of baby hatch. There were four ospedali in Venice, their purpose was to provide for abandoned and orphaned children. Boys were taught a trade, and girls were given a formal musical education. All four ospedali had choirs, all four competed with each other, trying to hire the best musicians in Venice. During the seventeenth century, the Ospedale della Pietà in particular became famous for its girls’ choir and sixty-strong all-girl orchestra. Vivaldi joined the Ospedale’s staff in 1703 as a young priest. His health was so poor that he was given a dispensation from celebrating Mass; and he was unable to play wind instruments. But he was known as a violin virtuoso, and had extensive musical knowledge. Vivaldi taught violin and music theory and composed as maestro di coro for his charges – he wrote motets, choral works, and later concerti. Under his direction, the girls’ choir and orchestra became more famous then ever. The girls played behind a screen to aristocratic audiences. Tourists flocked to Venice to hear them perform: In 1770, long after Vivaldi’s death, Jean-Jacques Rousseau attended a concert. He described the experience in his Confessions; the playing behind a screen, the beauty and impact of the music, the layout of the buildings, and finally meeting the musicians. 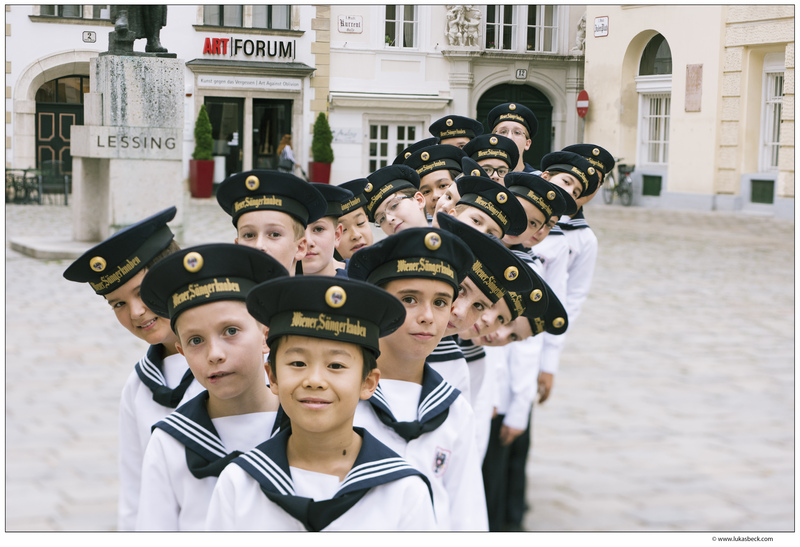 The Vienna Boys Choir sing part of Vivaldi’s Gloria in Curt Faudon’s film “Songs along the Silk Road”. Text: Domine fili, unigenite, Jesu Christe. Translation: Lord, son, only begotten: Jesus Christ. Sub tuum praesiduum is the oldest extant Marian prayer; the oldest known copy is found on an Egyptian papyrus, written in Greek and published in 1938 as Papyrus Rylands 470. The papyrus probably dates to the third century AD, which might mean that it was written in the midst of the persecution of Christians. According to the Coptic rite, the prayer was apparently part of the Christmas liturgy. The second part of the text (from „Mediatrix nostra“) is found in a Marian prayer ascribed to Bernard of Clairvaux (1090 – 1153): Per te, o Maria, accessum habemus ad filium (Through you, oh Mary, we have access to the son). The 1964 edition of the Köchel catalogue lists the motet as “doubtful”. Newer research thinks it is genuine, after all; there are thematic connections between the short motet (probably written in 1773) and Mozart’s Missa brevis, K. 192, composed in 1774, also in F major. virgo gloriosa, Domina nostra, advocata nostra, et benedicta. tuo Filio commenda, nos repraesenta tuo Filio. But save us always from from all dangers. Glorious virgin, our Lady, our advocate and blessed one. To your son commend us, and speak on our behalf before him. Mayrhofer, a poet from Upper Austria, met Schubert in Vienna in 1814; they became close friends. Schubert set 47 of Mayrhofer’s poems to music, and Mayrhofer wrote the libretti of at least two unfinished operas for his friend. “The gondolier” is typically Romantic. It can be read as a poem describing a night in Venice and celebrating escapism: It is midnight, the poet (or the skipper, as the case may be) is out on the waters in Venice, having a grand old time basking in the moonlight. There is however a gloomy undertow: “meine Barke”, my skiff, might also refer to the poet himself, who – unfettered, is being rocked by “des Meeres Schoß”, literally the bottom of the sea. The choice of words would support this, a “Barke” is the kind of boat Charon uses to ferry the deceased across the River Styx. Death is seen as the ultimate freedom. Finally, St. Mark’s campanile strikes midnight – the pianist strikes the same chord twelve times. Everybody is asleep, only the skipper – the poet – is awake, or should we say conscious. No one else has seen or understood. However one chooses to interpret the words, one thing remains clear – the first verse conveys a feeling, a longing to be shot of mundane worries, to be free. This certainly applied to Mayrhofer, who was forced to work for the censor’s office, a job he loathed. In the end, sadly, Mayrhofer, who suffered from depression, killed himself; he jumped out of his office window in Vienna. Wiegt dich des Meeres Schoss. The sea will rock you. Only the skipper is awake. Mendelssohn grew up surrounded by culture. His family was wealthy and generous with it. They travelled widely, and had a large house where they entertained many prominent visitors, among them Humboldt and Hegel. The Mendelssohns, members of the assimilated German-Jewish aristocracy, converted from Judaism to Christianity in 1816. The Mendelssohns saw to it that their four children had every possibility to learn. Felix, the second child, studied piano with Ludwig Berger and theory and composition with Karl Friedrich Zelter. At the age of nine, he gave his first public recital, at the age of ten, he became a member of the Berliner Singakademie. He was eleven when his own first compositions were publicly perfomed. A year later, he met Goethe, Carl Maria von Weber and Cherubini. Thereafter, he turned out sonatas, concertos, string symphonies, piano quartets and Singspiele which revealed his increasing mastery of counterpoint and form. In 1829, at the ripe old age of 20, he directed a pioneering performance of Bach’s St. Matthew Passion at the Berlin Singakademie (with a reported chorus of 600 singers): this one performance (an ‘event’) put Bach firmly on the repertoire list for choirs. Mendelssohn was also famous as a festival organiser, he was associated especially with the Lower Rhine and Birmingham music festivals. Mendelssohn’s most significant achievements as a conductor and organiser were in Leipzig (1835-47), where he conducted the Gewandhaus Orchestra to great acclaim. In 1843, he founded the Leipzig Conservatory and managed to recruit Robert Schumann and Moritz Hauptmann as teachers. His death at the age of 38, after a series of strokes, was mourned internationally. Mendelssohn’s music shows influences of Bach, Handel, Mozart, and Beethoven. He clearly liked to be inspired by his surroundings; his music often has literary, artistic, historical, geographical or emotional connotations; the underlying ideas are easily accessible. Sit nomen Domini benedictum ex hoc nunc et usque in saecula. May the Lord’s name be praised, from now on and into all eternity. Ola Gjeilo is a young contemporary composer, originally from Norway; currently serving as composer in residence to Voces8 in New York, NY. The medieval text by an unknown author echoes the thoughts outlined in the Gospel of St. John; essentially, without love we are nothing. With love, we are with God. The prayer it part of the liturgy for Maundy Thursday. The piece, written in 1999, is clearly influenced by Gregorian chant. It is one of Ola Gjeilo’s most popular works, performed by choirs all over the world. This is the first time a touring group of the Vienna Boys Choir sings it. Congregavit nos in Christi amor. Where there is charity and love, there is God. He has gathered us in the love of Christ. Bhajans, traditional songs of worship and devotion, are an important part of a Hindu revivalist movement during the Mogul period, known as the Bhakti (devotion) movement. Its members believed that spiritual salvation could be attained by anyone who had a pure and selfless love of God; whether or not a person practiced certain forms of worship. Bhajans are defined by a sense of devotion. They cover a broad spectrum of musical styles from simple chant (dhun) to highly developed versions comparable to thumri. Their poetic content ranges from chant to incantations or hymns. Traditional bhajans by great saint musicians such as Mira, Surdas, or Kabir are considered to be of the highest literary quality. The expression sat-cit-ananda rupam is used in yoga; the yogi desires only to accept reality, i.e. universal truth or Brahman. Cultivating sat, true existence, through spiritual practice leads to cit, awareness, which in turn provides the key to true happiness, ananda. sat-cit-ananda rupam might therefore be used to describe even moments of perfection and insight into Brahman. In this first bhajan, the phrase invokes the Hindu god Shiva, the destroyer or transformer, one of the Hindu trinity Vishnu, Brahma, and Shiva. This is followed by the second song, a prayer addressed to Shiva. Translation: Existence (truth), consciousness, bliss, Shiva. Oh, brother, let us sing and praise these divine names of the Lord with all our strength. Let us all take the divine name of Shri Shiva Shambhu and sing his praise. Hail, Holy Queen from the movie Sister Act is a choral favourite, bound to make the audience smile. Starting as a demure chant, it soon explodes into a jubilant choir with rhythmic clapping. In the film, a group of nuns performs them under the direction of Whoopi Goldberg, who plays a Las Vegas singer hiding from organised crime. She manages to transform the languishing nunnery choir into a spectacular ensemble singing with such pizzazz they manage to fill the hitherto empty church. The solo interjections, “Mater ad mater inter marata” and “Virgo respice” are not Classical Latin, and somewhat lacking in grammar, but then so are quite a few medieval texts. The first line might be rendered “Mother among mothers” (which should really be “Mater inter matres”; if “ad” is correct, it would require the accusative matrem). However, perhaps it should just be understood as an exclamation, “ah”, Mother, oh, Mother. “marata” is not a word at all; it may be a typo for either merata/meraca “pure”, or murata “walled” – inter murata might then mean “surrounded by walls”, as in a nunnery perhaps. As the words were written for the movie, and the character who comes up with them is a Las Vegas singer, they were perhaps not meant too seriously. Susanne Sommer’s choreography quotes the scene in Sister Act and at the same time allows the boys to make it their own. Petar Liondev, born in Harmanli, Bulgaria in 1936, made his name as a collector and editor of folk music in the 1960s and 1970s; he transcribed more than 40,000 songs. His own compositions were mainly written for choral ensembles, male and female choirs, children’s choirs, and mixed groups. A kaval is a chromatic, end-blown flute played in Turkey and throughout the Balkans, mainly associated with shepherd music. Playing the kaval requires considerable skill; a player uses the air flow and the position of mouth and lips – the embouchure – to change pitch and key. Some players employ a technique known as circular breathing, which allows them to play without pausing for breath. This skill was and is widely admired – the kaval player mentioned in the song clearly was a virtuoso. Another first in the Vienna Boys Choir repertoire – Oliver Stech has his choir sound like a group of Bulgarian fieldworkers. Their recording of “Kaval sviri” was used in Curt Faudon’s upcoming “Good Shepherds” film. горе доле, мамо, под солено. ako mi e jabandzhijche, shte go lubja dor do zhivot. If he is a stranger, I will love him all my life. In 1826, 17-year-old Mendelssohn read the Schlegel’s translation of Shakespeare’s famous play; this prompted him to compose an overture for the piece. The other ten movements of incidental music for the play (including the famous “Wedding March”) were written in 1842, commissioned by King Frederick William IV of Prussia. The Vienna Boys Choir have devised its very own interpretation of Puck’s magical woods, and the creatures who inhabit them. Some of the singers will surprise you, and hopefully make you smile. To choir director Stech, this piece is the first of three night pieces or lullabies. Hence, you long-legg`d spinners, hence! The Seal Lullaby is the opening poem in Kipling’s story The White Seal; the mother seal sings to her pup. Whitacre originally wrote it for an animated feature, which in the event was never realised. So instead, Whitacre used it to sing his own son to sleep – with a success rate of less than 50%, according to his website. The tune has since become a favourite with choirs. Atahualpa Yupanqui (1908 – 1992) came across this lullaby in the border region between Venezuela and Colombia; it is also known in the Carribean. Atahualpa Yupanqui recorded and published it. Duerme negrito has since been sung by artists such as Mercedes Sosa and Victor Jara. Over time, it became hugely popular in Spanish speaking countries. There are Classical versions as well – including a recording by French countertenor Philippe Jaroussky. The text, which invokes a white devil, seems curiously at odds with the hauntingly sweet, soothing melody. There is a whole slew of Latin American lullabies referring to a bogeyman known as (El) Coco, or Cuco, whose chief occupation seems to be devouring children. However, while bogeymen are used to frighten children into good behaviour (in this case, going to sleep), it is also understood that they are not real. Te va a traer rica fruta para ti. Trabajando y no le pagan, trabajando sí. Trabajando y va tosiendo, trabajando, sí. Trabajando y va de luto, trabajando sí. Para el negrito chiquitito, trabajando, sí. Duramente, sí. Va tosiendo, sí. Va de luto, sí. she will bring you many things. the white devil will come, and – wham! – he will eat your little foot. Working, working hard, working, oh yes. Working and they don’t pay her, working, oh yes. Working and she will cough, working, oh yes. Working and she wears mourning clothes, working, oh yes. For the tiny little black one, working, oh yes. Hard, oh yes. She coughs, oh yes. She wears mourning clothes, oh yes. This quintessentially Mexican song, written in 1882 by Mendoza y Cortés, has Spanish roots. The rhyme scheme corresponds to the classical Spanish seguidilla of the 17th century, and the Sierra Morena mentioned in the text is a Spanish mountain range known as a haunt of bandits and highwaymen. Nowadays, it is associated with all things Mexican, and sung, with fervour, at international football matches. Pretty little darling, that is well deserved. Pretty little darling, because it is mine. In the original animated film, “The Bare Necessities” was sung by Baloo the bear Phil Harris and Mowgli the man-cub Bruce Reitherman. Baloo instructs Mowgli in the ways of the jungle – bears know. The reprise at the end of the film was sung by Sebastian Cabot as Bagheera and Phil Harris. The song, which was famously covered by Louis Armstrong, received an Oscar nomination in 1967. The Vienna Boys Choir, whilst not expecting a nomination, performs this with several dancing bears, a corresponding number of mancubs, and a shrewdness of apes. Singin’ in the Rain, originally written for MGM’s Hollywood Revue of 1929, is the eponymous and most famous song from the 1952 film directed by Gene Kelly and Stanley Donen and starring Gene Kelly, Jean Hagen and Debra Reynolds. To all intents and purposes, it is a musical made for film, using known hits. The story of silent film stars Don Lockwood (Kelly) and Lina Lamont (Hagen) trying to “make it” in a talking film, placed 10th on the American Film Institute’s list of 100 great films; the AFI ranks it as the last century’s best musical. Lockwood, who can dance, survives as a star, whereas Lamont, who has a grating foghorn for a voice, fails and is replaced by her vocal double Kathy Selden (Reynolds). Kelly choreographed the song as a soaking wet dance: Lockwood has just realised that he has fallen in love and therefore rather enjoys the bath, dancing with his umbrella in the middle a puddle. Kelly, who was running a fever at the time, actually danced in a mix of water and milk, so that the water would show up on film. The scene is often quoted or parodied; this year, the Vienna Boys Choir perform their take on it, umbrellas and all. Watch out for the sun and clouds. And singin’, singin’ in the rain. Hlonolofatsa, also known as Hlohonolofatsa, is a spiritual hymn of the Sotho people. Of the approximately 8 million Sotho, 5.6 million live in South Africa, 2 million in Lesotho; they are the second largest ethnic group in Southern Africa, after the Zulu. Today, most Sotho are Christian; they belong to the Roman Catholic church, to Protestant, or independent African churches. Iyo, in the name of the Father. This song represents in many ways the Vienna Boys’ Choir’s motto; singing is our joy. It is about the pleasure derived from singing, especially communal singing. The oldest reference comes from the Tyrol: In 1935, the song was recorded there by Adalbert Koch and Norbert Wallner, two collectors of folk songs. Further verses can be (and are) invented on the spot to suit the singers, ad infinitum. Until you are out of breath. A cheerful alpine song, which describes the ascent to the alpine pastures in summer and the jolly relations between the herdsmen and women. The Austrian and Bavarian word “aper” literally means “(partly) snowless”, from Latin apertus “open”. The song was used in Curt Faudon’s film Silk Road (2008); where the choir boys sing it standing on the Great Wall of China, prooving that yodelling serves as a means of communication across valleys and mountains. In tonight’s concert, you will see five choristers dance a “Schuhplattler”; an Alpine dance performed by young men. wann der Goaßer mit die Goaßlen geht und Senndrin mit die Kiah. da siach i schon di Hittn stehn und jauchz vor ihrer Tüa. When the goatherd goes with the goats and the dairymaid with the cows. I see the hut standing and I shout before her door. Johann Strauss was the second Strauss with the first name Johann, but he is undoubtedly the most famous. At least four members of the family were active as composers: his father Johann (1804-1849), Johann himself and his brothers Joseph (1827-1870) and Eduard (1835-1916). When Johann was ten years old, his father became Hofball-Musikdirektor (Music Director at the Court Balls). A high honour, but father Strauß did not want his sons to become musicians (a rather suspect profession) and enrolled his son in a trade academy. Johann (aided and abetted by his mother) had music lessons behind his father’s back. At nineteen, he founded his own very successful orchestra. Much of his work is influenced by gypsy music and Jewish Klezmer music. There is an inherent ambiguity in it: Strauss, who made the entire city of Vienna dance, was a nervous, ill-tempered and lonely man, and he could not dance. Vergnügungszug is a typical Strauss polka painting a picture of contemporary life: It was a favourite Sunday pastime in the nineteenth century to explore a city’s surroundings by steam train; the ride, not the destination was the point of the exercise. Vergnügungszug (literally ‘pleasure’ or ‘amusement train’), a cheerful polka, tells the story of such an outing, complete with pushing and shoving to get on to the train, sandwiches, rabbits on the tracks, bird-calls and train whistles. harte Plätz’, um die geht’s. Denn um die ist das größte Griss. und wir kommen hin auf jeden Fall. fragt begierig jetzt der kleine Sohn. gibt dem Bub a Wurstbrot auf der Stell. macht das Fenster immer auf und zu. kurzerhand gibt er dem Buben a Watschn. Und der Bua reibt sich die Wangen. tut die Mutter voll Mitleid sagen. schau jetzt beim Fenster hinaus. Auf den Schienen, da sitzen Hasen. Schaun vom Gebüsch auf den schnellen Überraschungszug. Bitte Leute eingestiegen . . .
Hard seats, you have to fight for them. They are really in demand. The little boy wants to know. And gives the boy a sandwich. He opens and shuts the window. And he boxes his ears. And the boy rubs his cheek. There are two rabbits on the tracks. To watch the fast train from the bushes. Everybody board the train . . .
Strauss composed Kaiserwalzer for the inauguration of the new concert hall in Berlin in 1889. Emperor Franz Joseph had visited Emperor Wilhelm II that year, and toasted him with the words “hand in hand”, and Strauss had originally intended to use the quote as title. His publisher Fritz Simrock suggested the catchier title “Kaiserwalzer”. It sounded far more imperial, and had the added advantage that it could be taken to refer to either monarch. Kaiserwalzer was first performed in Berlin on 21 October 1889, with Strauss himself conducting. Right from the beginning, the majestic waltz proved extremely popular with audiences everywhere: It is one of Strauss best known pieces. There are three feature films that make extensive use of the music; they even use its name as their title. Among them is a 1948 film by Billy Wilder starring Bing Crosby. The Vienna Boys’ Choir has been singing this particular waltz since the 1920s. In 1953, they recorded it for the soundtrack of Franz Antel’s movie by the same name. In the film, it is sung before Empress Elisabeth (“Sisi”). denn s’ist jetzt holde Frühlingszeit. freu’n sich alle, Sonne wieder scheint. denn so liebt der Wiener Frühlingszeit. Das macht den beiden warm. Dreh’n sich beide im Tanz. Everyone is cheerful, the sun shines again. That’s how the Viennese like their spring. Warming both of them equally. May it stay like this forever.